The title of Dale A. Hildebrandt's latest manuscript is Foam Kangaroo Abs . The ebook started out as a very comprehensive, thorough, detailed, and examined-from-all angles treatise on all things related to anagrams within the magic and mentalism world. Not only are progressive anagrams discussed, but there are also details on branching anagrams, non-verbal branching anagrams, the puzzler's anagrams wherein words are re-arranged as games or clues, visual anagrams, and other topics either tangentially or specifically related to anagrams in the mystery arts. Many others either confuse branching anagrams for progressive anagrams, or they use the two terms interchangeably. The so-called "correct usage" of the term progressive anagram is mostly ignored in Foam Kangaroo Abs because the term has entered into the common lexicon of mentalism/magic with a different definition then what it once stood for in the past. The first part of Foam Kangaroo Abs deals with anagrams; in fact, the title of the ebook is an anagram for "BOOK OF ANAGRAMS". If there is an application of an anagram in any form whatsoever (be it method, effect, prank, puzzle, plot, presentation, or otherwise) I have explored all the references I could possibly get my hands on. I have also talked with other magicians who are leaders in the field when it comes to progressive/branching anagrams as a methodology for tricks. I start the manuscript proper off with a Brief History of the principle and some deeply researched crediting. At the very end of the Anagram Section is a comprehensive list of credits and resources that you will definitely want to explore. I then briefly explain the difference between a Branching Anagram and a Progressive anagram; this is not done to belittle anyone for using the "wrong" term. This is simply so that when others start talking about anagrams you can find out which kind they are dealing with; most of the items in my book would usually be classified as "branching" but I use the term "progressive" because most creators use it as a common name for the method behind the tricks. Next, I explain three ways to limit choices. None of these ways look like you are actually narrowing down the category you have provided into sub-categories, and that you have also directed their thoughts to a certain subcategory. When manually generating anagrams, this comes in quite handy. Also, if you use a progressive anagram generator, you can cross of names that aren't working in the anagram generator and use one or more of the choice limitations to make the anagram generate properly for you. After that I discuss when and when not to us lists with progressive anagram based mentalism. Up next, I give you a brief introduction in the memory system of the Ancient Greeks (the loci method) so that you may use it to completely memorize your anagram lists. If you simply cannot remember the lists then you'll love what I have next. I have come up with a way to hide a crib sheet right in front of the audience members and come up with a congruent reason on why they can not look at the crib you're looking at plus once the effect is over the open crib sheet becomes immediately out of sight and out of reach. "A Table With Reservations" was first published in Hand Bluffs Pluse More Stuff and is included in Foam Kangaroo Abs to round out the current ebook. In "A Table With Reservations", you use a no-list PA to tell your volunteer what item they are thinking of on an imaginary table. You then throw in a real "kicker" and tell them the hair and eye color of their imaginary companion. Both this item and the next "Seven Sins Sense" have been previously published elsewhere and are included for the sake of completeness. In "Sevens Sins Sense" you can divine one of the seven deadly sins that a participant is committing in their mind. "Twelve Apostles Anagram" allows you reveal one of Jesus's 12 Apostles from the mind of a volunteer. "Jack's Pocket Change" asks a volunteer to put themselves in Jack the Ripper's shoes in 1888 and think about what coin would be in their pocket as they mutilate a victim. Next up, we deal with modern American coins in a sort of anagram that allows you to divine any thought-of in-circulation USA coin from the thoughts of the spectator. While still expounding on imaginary coins, I next share ten methods/presentations for Max Maven's Positive/Negative, as well as an observation on the Maven's original effect. Then, there is a quaint effect wherein the mentalist brings out a bunch of cigarette boxes, turns his back, and has a volunteer remove a cigarette from one of the boxes. The mentalist, without touching anything after the fact, tells the volunteer what brand of cigarette was chosen. With some thought, this effect could also be used to divine a person's favorite brand of smokes. Still dealing with "cancer sticks" (aka cigarettes) there then follows a totally impromptu torn and restored cigarette that uses a borrowed pack of smokes and requires the performer to carry no extra bits, bobs, or gimmicks. This is an impromptu piece of mini-theatre that is accomplished through verbal/mathematical/physical sleights. "VCR Zodiac Sign Test" is a Zodiac Sign Revelation effect where the spectator never says a word during the process. This doesn't rely on any progressive anagrams, however it is a non-verbal branching anagram. This particular effect has been previously published. Following "VCR Zodiac Sign Test" is one of my favorite pet effects "Birthdated", wherein you reveal the birth month of a complete stranger within a two-month range of accuracy, using a borrowed pen and piece of paper. "12 Common Male Archetypes" is a PA and the title is self-explanatory. "Double Sided Anagram" combines a PA with a double-out and uses an approach that I, personally, have never seen explored elsewhere. This effect allows a free choice of many words but due to the methodology you are able to give a list that doubles the effectiveness of the anagram. "Designer Lip Balm" revamps a Paul Harris effect so that Mr. Harris's effect can actually be performed without having to go through a fruitless search looking for the CARMEX container that Paul Harris claimed to have found, and that nobody I know has ever actually seen. I then include a PA that lets you reveal a word being thought about from the text on the label of the Designer Lip Balm. "The Commons" uses a real life story combined with a bit of myth making to allow you to reveal what player from a baseball card someone has chose in their mind. "Star Wars Forcing Bank" combines a PA with a Forcing Bank to accomplish pretty much the same thing as in "The Commons" only this time with Star Wars Trading cards and with what appears to be hundreds of choices. Then, we have "Famous Magicians". This one's gonna be more impressive to your magic club buddies than to real people because some of the magicians in the list are not that well know to the public. However, every single name on the list is near and dear to any dedicated magician. "Stick Man Anagram" has you drawing a Stickman and then prognosticating which part of the Stick Figure a friend is thinking of. I follow this up with "The Stick Trick" which uses an observation from the field of Anthropology as a method to allow you to predict an aspect of a stick figure that has been drawn by a volunteer. This uses knowledge that is not common to the average person, and therefore is a miracle to said person. "Making Mistakes On Purpose" shows almost everything that can be mistaken for an UFO, how to take advantage of each situation for UFO-creating purposes, and gives a diagram which, with some thought, could be used a PA to divine what a person really saw in the sky and/or to make what they saw in said sky into whatever you want to interpret it as. There follows two brief notes, one of them from the highly creative Liam Montier, on how to use Shapes in place of Word in a PA. Next up, is one sentence that I contributed to a manuscript by the talented Iain Dunford on how to use the game of "Hangman" to cover up the fact that PA's often seem like games of "Hangman", thus using the cover of the obvious to deflect from the obvious. "Tell All" is a short idea sparker for any computer programmers, app makers, or coders out there that combined the programs DOCTOR and ELIZA with the concept of "Reflective Listening" and a database of computer-implemented magic tricks that the program can perform including Progressive Anagrams. "Stroop-A-Gram" uses the Stroop Color Test from the field of psychology combined with a Progressive Anagram. Due to how the Stroop Test works, this allows the performer to turn multiple misses into direct hits while divining the color in the mind of the volunteer. "Playing Card Anagram" eliminates all face cards and all the aces and then allows you to divine the playing card number and suit. "Reading Roy G. Biv" allows you to give a psychic color reading and then tell the participant exactly which color they have in mind. "Don Juan's Diner" lets you pick up the thoughts of a volunteer reading a Mexican Food menu. "Going Postal" was first published by TC Tahoe in "Mind Over Magic", and uses a set of PA principles to divine a chosen postcard. "Continents", inspired by Maven's "Contimental" lets you reveal a choice of one of the seven continents on Earth. "H.I.S. And H.E.R.S." was previously published in an issue of my satirical magazine The Cramp but was so well received that I've republished it here as two legitimate methods for book tests. Then, we explore a few sentences wherein the mentalist may pick up the thoughts of a volunteer on what word said volunteer has picked from the paragraph. Next up, in "House Draw", we combine the psychological subtlety of how people normally draw houses with a nice anagram. For fans of the television show "The Big Bang Theory", we then explore a modified 15-item version of Rock Paper Scissors that allows us to reveal which item (rock, paper, etc.) the participant has chosen to play. Then, we explore common pets people have has children. Next, we apply the theme from Max Maven's "Range Rider" to Midwester States and their Capital cities in the USA, allowing us to divine both the state and said city. I feel the scripting for this particular effect is stellar. We then go through the theme of a grocery list which allows for multiple methods, effects, and revelations. After that, Adam White has kindly given me permission to reprint his "i.P.o.d." manuscript in full. Adam's effect seemingly let's a random person choose a song from thousands on an MP3 player and then the perform reveals, in dramatic fashion, not only the song but also the chosen artist. Finally, we end the Anagram Portion of the book with a list of Anagram Resources compiled by Dale. Next up is a variety of items that generally do not rely on anagram in any way, shape, or form. The first routine was previously published as a stand-alone eBook, titled Rock Paper Scissors Time Full Routine . A section labeled "Essays/Thoughts" is next up. "Awaken The Sorcerer Within" is publicly release for the first time, while "Psychomagic Essay" is republished for Foam Kangaroo Abs . Next, we get into my second favorite section of the Foam Kangaroo Abs , titled "Caveman Collection". The first effect allows you to divine an image chosen from a very strange catalog. Included in the book are the "printable props" that may be used for performances (of course, all manufacturing and marketing rights are reserved for all the intellectual property throughout the book Foam Kangaroo Abs ). "555-Hollywood", an item of mine that I am reprinting here, uses a similar methodology and contains the lists you'll need to perform said trick. I consider "Haunted House Halloween Horror" (previously published in my highly acclaimed book Hand Bluffs Pluse More Stuff ) in the same general vein as the previous two items and so I have grouped these effects together. Another trick in the same general category as these is my effect "Bunco Branching Matrix". This utilizes a method developed by Andreu, with subtleties, themes, and a presentation developed by Dale Hildebrandt. This also includes a printable "prop" and allows you to play the part of a hustler/carnival worker wherein an imaginary dice game is played by an audience member and you then show that you already knew which price they were going to get in advance! Then, I have included a couple basic, customizable, template printable "props" for the "Caveman Catalog" routine that can be used as justification for handing out the printed-up card props from said routine. After that, I explore how to use a combination of a very old principle in magic with a mnemonic system in order to reveal which receipt a participant has chosen, but instead of just revealing the chosen receipt, the performer goes one more step and reveals the total amount of money spent. This utilizes a principle that was developed by Paul McTaggart and Eric Hall in a marketed effect. My routine uses one basic marking principle and achieves a different theme and presentation, with a different emotional hook. "Phone Phreakery" is a section that deals with routines involving...wait for it...wait for it...phones! "Homage to Huffman" is a modern day, working, version of an effect published in "The Compleat Invocation" VOLUME 3 as submitted by Dan Huffman. This combines my adaptation of Huffman's concept with a principle I first explored and published in my eBook Risk and Reward . Next, follows how to use a cell phone's features as a method for a Two Person Code Act, right under the noses of your audience (this is best performed informally, such as in a bar). "Three Phone" utilizes modern day phone technology as a method for a three-way out. "Simple Stupid Cell Stunt" is just a thought-starter, a seed of something to be grown; a sort of thought-experiment. Consider it a challenge. You perform the old Telephone Wizard Effect, only there is no verbal cue-ing, the volunteer dials the Phone Wizard's number, and the magician STAYS SILENT the ENTIRE TIME! Taking up the gauntlet thrown down by the previous challenge, Liam Montier provides a routine, written up much as back in the old bizarre magick days of The Invocation and Bascom Jones's Magick , wherein Liam's friend Dale wins a bet by predicting the first thing Liam's friend Michael will say to Dale. Of course, most people just say hello, so Liam instructs Michael to say something totally random. When Dale arrives on the scene, and Michael shouts the word "Badgers", Dale proves he knew along with his trusty cell phone backing up his claim. The next section is titled "Behind Breaking Bread". This is a ton of presentations for a puzzle originally documented in the 1400's. Included is the best, friendliest, easiest explanation I have seen for this method as explained by Liam Montier and originally written up in his One-Man Issue of my periodical Other Stuff 2 . Full credits are given for this puzzle/effect, as well as many routines, applications, and so forth. Then we come along to a section titled "Odds and Ends" in Foam Kangaroo Abs . "Backwards Business" allows you to borrow a potential client's business card, cause it to go backwards in time so it is only half-printed, make it go back further in time so it becomes completely blank on both sides, and finally go into the future so that your own business card information is now printed on the card they believe they just handed over to you. "Wonderful M & M's" combines a principle developed by Tommy Wonder with a presentation developed by Jeff Prace. The magician keeps his Silver Coins for his coin magic inside an old, otherwise empty M & M 's candy wrapper, because robbers steal coin purses and wallets all the time, but rarely do they go for old candy wrappers. The climax of the coin routine is when the now empty candy wrapper, which has been sitting on the table during the entire coin magic routine performance, is picked up by an audience member. The audience member finds not only is the candy wrapper now re-sealed, but is full of candy once again. "Arctic Name Test" explores ways that Facebook Personality Tests and other online promotions and/or scams really work. "Ending The Endless Chain" is my finisher to The Endless Chain con game. Normally, a person sticks their finger in one of the loops and the performer can either trap or release said finger. Unfortunately, this is repeated ad nauseam until the audience starts thinking of how to use said chain to maim said performer for such a lame routine. "Ending The Endless Chain" gives a script and uses a very well known (by most magicians) effect that ties in perfectly with The Endless chain presentation. The script given totally justifies the transition between The Endless chain and the finale, and require no extra props, pieces, or parts. I have published "Three Lucky Cards" in many other places, but here in Foam Kangaroo Abs I include some very helpful photos. Next up, we have "Psychic Self", previously published as a stand-alone eBook. And last, but not least, I have included my routine/methodology that I have dubbed "STOOPID: Star Sign Stupidity" which is the cleanest, and most prone to fail, least likely to success zodiac sign divination. Welcome to Foam Kangaroo Abs . 1st edition 2016, 175 pages. I couldn't agree more than what Christian Fisanick has to say about this EBOOK. Also I agree to make sure you buy THE PRODIGAL by ATLAS BROOKINGS first to make sure you get a very good understanding how the BA/PA system works and a detailed understanding of presentation. In my opinion also buy the Matt Mello books and THE UNKNOWN MENTALISTS books on this subject among others. You will have everything from traditional to very unusual approaches. I need to buy one more MATT MELLO EBOOK PATHS to complete my collection! I'm crazy but imagine doing this: I plan to do this close up. I will use the effects CONTINENTS and MIDWESTERN STATES out of this EBOOK and combine this with COUNTRY CONUNDRUM out of ATLAS BROOKINGS THE PRODIGAL EBOOK. This way I can divine a continent the spectator is thinking of, a country a spectator is thinking of, AND a Midwest state and capital a spectator is thinking of. Also by the way, I have a list of words that I use to test a spectators psychic ability in my wallet based on the PA principle. If the spectator doesn't believe I can walk on water after this I give up. Of course, If my brain doesn't turn to mush with this I'll even learn more BA'S/PA'S in the future. I hope all these talented people come up with MORE BA/PA EBOOKS in the future. I can't wait to add them to my library! Well done my friend. I give this material my highest recommendation. If someone doesn't buy this they lose!!! 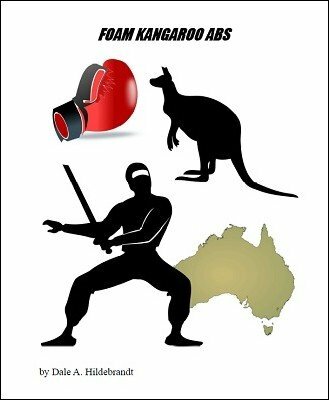 The weirdly titled Foam Kangaroo Abs is an ebook mostly devoted to progressive and branching anagrams. It has tons of material from discerning one of the 12 apostles, a pop song, a food from a grocery list, and part of a stick man to the classic spectator's sign of the Zodiac. If you like PAs/BAs, then this book will be incredibly useful. If you don't have any experience with them, I'd suggest The Prodigal by Atlas Brookings first to get attuned to performance details. The way Brookings performs PAs/BAs is outstanding; he makes it look like real mind reading. The trouble is, of all the areas of mentalism, this is one of the most difficult routines to pull off. Badly done, a PA/BA looks like a half-baked guessing game or a poor man's Wheel of Fortune. This stuff takes a lot of memory work and practice to do smoothly and effectively. In addition to the PA/BA routines, there are some bonus effects, as listed in the ebook description, such as a multi-stage Rock-Paper-Scissors routine and yet another nearly half-dozen approaches to Max Maven's classic Positive/Negative. For me, these things were like finding extra presents under the Christmas tree. Nice indeed. Pricey ebook? Yes. Worth it? Very much so. While I don't think this is for everyone, and you certainly won't perform everything here (that would be sheer memory madness), my mind was boggled just skimming through it. There is some really creative food for thought in Foam Kangaroo Abs, and I recommend it. I know that I am going to spend a lot of time studying it in the near future.